Harry N. Abrams, 9781419728822, 288pp. Laura Geringer Bass was the publisher of Laura Geringer Books, an imprint of HarperCollins, for more than 20 years. She is the author of Sign of the Qin and the Myth Men series. She lives in New York City. "Bass tackles some heavy issues—having a sibling with a disability, losing a parent suddenly and at a young age, and coping with a parent's depression—but she manages to do it with grace and empathy." "In this tenderhearted tale, Bass (Sign of the Qin) conveys the complex, conflicting emotions that arise in a family facing the unexpected death of a parent . . . It’s an emotionally nuanced exploration of grief and resilience." "Bass excels in portraying the family members, their relationships, and how they shift when one person is no longer there . . . A heartfelt story of loss, grief, and healing." "Bass balances the coming-of-age narrative with a grief journey that sensitively and realistically shows how friendships and family relationships change after a tragedy." "Readers struggling with responsibility for younger siblings might especially relate to this." 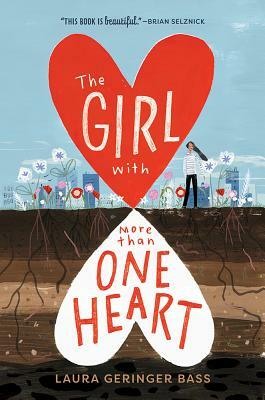 "Throughout The Girl with More Than One Heart, Briana reflects on happier days with her late father . . . and those memories propel her to find her own way, to “be her own” (as her second heart tells her) and embrace her new life." "Written through a series of flashbacks mixed with the present day, Bass has created a sad but hopeful novel about grief and growing up . . . This is a heartwarming tale full of believable characters and situations, with an ending that is hopeful and realistic."